Limousines and motorcade vehicles for President Barack Obama are seen parked in the driveway outside the residence of movie producer Harvey Weinstein in 2012. WESTPORT — Harvey Weinstein sold his two remaining properties in Westport to town resident Andrew Bentley for $16 million earlier this month. 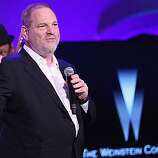 The Feb. 2 sale came in the wake of sexual assault and harassment allegations leveled against the media mogul and little over a week before New York’s attorney general filed a lawsuit against the Weinstein Company, the film studio founded by Weinstein and his brother. Weinstein bought the Greens Farms early-1900s colonial home at 26 Beachside Ave. with his first wife, Eve Chilton, in 1994 and co-owned the beachfront property until the couple divorced in 2004 and Weinstein became the full owner, according to tax assessor records. In 2000, Weinstein bought the adjoining property at 28 Beachside Ave. for $4,000,000 and kept it as an empty lot. While not his primary home, Weinstein held fundraisers for both Barack Obama and Hillary Clinton on the properties. Down the street from the film producer, married couple Andrew Bentley and Fiona Garland bought 124 and 128 Beachside Ave. in 2010 for $2,100,000 and $11,585,300, respectively. In the years since, Bentley has gobbled up three more properties on Beachside Avenue, the most recent acquisitions being Weinstein’s former properties. “I’ve never met or seen Weinstein,” Bentley said of his former neighbor, who was known to spend weekends at his Westport home with his former wife Georgina Chapman and the couple’s two young children before a slew of sexual assault and harassment allegations against Weinstein came to light in October. Bentley said the property transaction was completed through the real estate company Coldwell Banker. Tax assessor records show Bentley bought 26 Beachside Ave. for $10 million and Weinstein’s adjoining property for $6 million. In the coming months, Bentley said he plans to work with the architectural firm Roger Ferris and Partners, which has an office in Westport, to come up with ideas for the property, and ostensibly a new home to put on the currently empty 28 Beachside Ave. property, which Bentley said is zoned as a building lot. “We’ll let them use their imagination and come up with the coolest thing they can think of,” Bentley said. As for Weinstein, he has since been fired from the company that bears his name. It was on the verge of a fire sale until New York Attorney General Eric T. Schneiderman filed a suit Feb. 11 against the Weinstein Company for allegedly violating state and local gender discrimination and sexual abuse and harassment laws. The purchase may be back on, however, following a “productive” talk on Wednesday between Schneiderman and the group of interested investors, according to TheWrap.